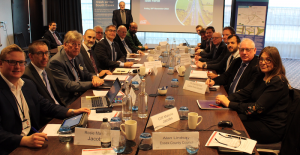 A new task force has met for the first time in a bid to create a collaborative vision to tackle issues in, along and around the A127. Representatives from local councils, Transport for London and local MPs (James Duddridge and Stephen Metcalfe) met for the inaugural A127 Economic Growth Corridor Task Force at London Southend Airport Holiday Inn on Friday, 30 November. The A127 is currently one of the busiest “non-trunk” roads in the country – which means it is not overseen by Highways England. More than 78,000 vehicles use this route every day. The route was originally built in 1925 and upgraded to a dual carriageway in 1940. Users of the road already experience a range of problems daily, and together these issues represent one of the main challenges to sustained economic growth in the area. Essex County Councillor Mike Steptoe, who chaired the first meeting of the Task Force, said: “For nearly 80 years the route has suffered from a lack of investment, this task force will bring the A127 the attention and funding it deserves. Everywhere in the region businesses and communities are growing, and we believe our transport network needs to support this. It is crucial that the region’s infrastructure keeps pace, allowing us to create the conditions for our residents and businesses to thrive. “All options are currently on the table, including the potential for a M127 motorway to acknowledge the key strategic importance of this route. But we are not just limiting ourselves to roads. We will be exploring the bigger picture with a view to more sustainable solutions like walking, cycling, bus and train infrastructure which could all help to tackle problems along the entire route.